Sunny weather heralded the start of the Miami boat show yesterday, and Hatteras chose this occasion to unveil its new flagship, the 95 Raised Pilothouse. This 30.48 metre composite motor yacht has modern lines, designed by the in-house team, and offers generous interior volume and spacious outside areas with a large sundeck covered by a hardtop. The design team has created modular furniture allowing a custom fitting out of this area. The standard interior layout will accommodate eight guests in a full-beam master, a VIP and two twin cabins on the lower deck. Large rectangular portholes will bring in more natural light at this level. There is also an option to create a fifth cabin - or master suite - on the main deck in place of the large American-style galley. There are also two possible propulsion options: an 'economic' version with twin 1,900hp Caterpillar C-32 engines and a 'muscle' version with twin 2,600hp MTU 16V2000 engines. They allow top speeds of 25 and 29 knots, cruising speeds of 19 and 24 knots and ranges of 679 and 492 nautical miles, respectively. 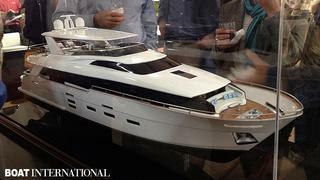 The first Hatteras 95 Raised Pilothouse is now scheduled for launch in summer 2013.